One thing you need to have when you work on these projects, and are required for most of the projects you are reading about here, is a work bench! This is a great item to have to collect all your tools and materials around your shop. 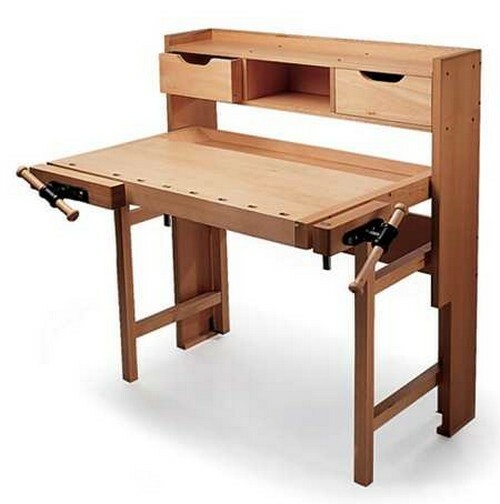 You can work smarter and not harder with a well designed work bench. Layout – Start by laying out the height, width, and length of the bench. This can vary according to space available. Cut your leg posts from the 4×4″ post stock, allowing 1″ for the bench top. If the bench is going to stay in position, check the levelness of the floor – now is the time to make sure the bench will be stable. Bench Supports – The width of the bench can be anything. Remember, however, that you want a width that you can easily reach across without reaching too close to tool hazards. Also consider that you might be leaning forward and reaching up for a tool on a pegboard. Cut and miter to length 2×4″ stock for the side bench supports. Try to keep these supports between the post legs by countersinking toenail holes into the 2×4″ supports and the post leg. Cut 2×4″ stock to form the bench’s top frame and then cut 45-degree blocking to be placed at the corners of the frame top and legs. Leave the front of the bench open for stock storage. Attach Top – Cut the top length and width to taste. Pre-drill screw holes and screws the top to the frame. Remember that this piece of the bench may be replaced as the bench becomes worn and used. 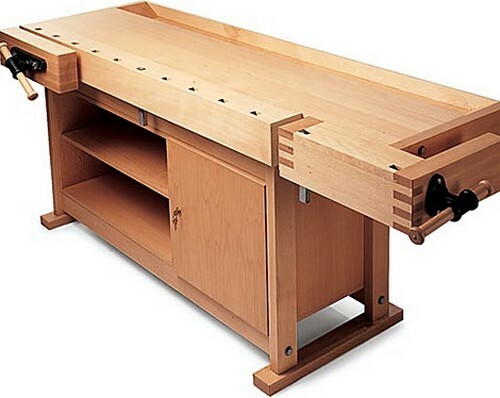 Accessories – One of the good things about a woodwork bench is that you can customize it to your particular working habits or hobby requirements. Drawers are a good example. Since you left space in front of the bench, it will be easy to install custom drawers. If you tend to use drill bits quite a lot, try drilling some holes into the bench top or a piece of strapping within the drawer to create a place to store them.